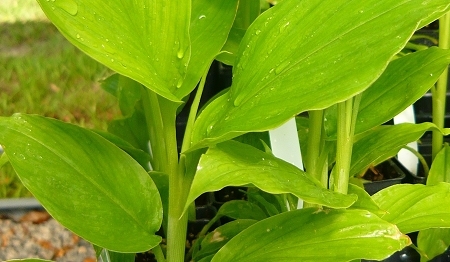 Turmeric Plant (curcuma longa) Yellow turmeric plant. Roots commonly used a spice to make curry and in other Indian dishes. Contains curcumin a well research compound that has powerful anti-inflammatory properies and antioxidants. Roots can also be boiled to make turmeric tea. Growing conditions are similar to Ginger. Large green leaves and white flowers when in bloom. Plant grows to about 4' tall. Thrives in high heat and humidity, this tropical perennial can be container grown in a loose rich soil. Prefers some afternoon shade. Bring indoors when temperatures drop below 50 degrees. Roots are ready to harvest in 7-10 months. Tropical perennial in zones 9-11. One live starter plant in 2.5 inch container.